Happy Easter and have a great weekend! Main compartment -Bunny shaped sandwich with candy eye, Colby ears and Provolone tail. Bunny is munching a baby carrot. Lower left - Apple slices cut to resemble rabbit ears. Upper left - Yogurt covered raisins in a bucket cup and Annie's organic bunny crackers. Cute rabbit! Love the apples! Super cute!! I actually met the easter bunny at work todat . Happy Easter! So cute! Hope you had a great weekend! 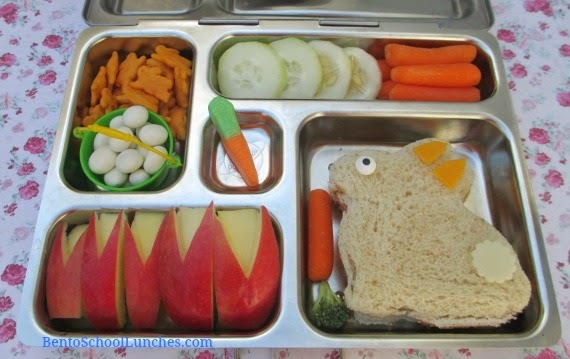 Such a cute bunny lunch!